GSA has earned a leading reputation in designing and implementing monitoring systems and developing research programs to evaluate hydrologic and ecological processes. GSA has deployed and maintained instrumentation for long-term monitoring of climate, vadose zone flow and transport, surface water flow and quality, and groundwater elevation and quality. 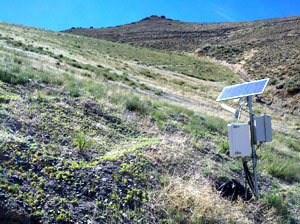 GSA’s monitoring systems are designed to withstand environmental conditions while meeting data requirements. Because of the harsh environments and uniqueness of GSA projects, we have developed proprietary sensors to meet specific project needs. GSA is also unique in that we operate a hydrologic testing laboratory that uses state-of-the-art methods to determine saturated/unsaturated flow properties of porous media. The laboratory specializes in determining the flow properties of soils and waste material with significant amounts of gravel fragments under various conditions of saturation and load pressure. © 2019GeoSystems Analysis. All Rights Reserved.